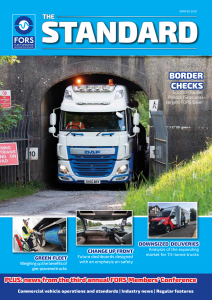 The winter edition of the FORS magazine ‘The Standard’, recently sent to all FORS members, is now available as an online version. The magazine is dedicated to operators, suppliers and transport professionals, focusing on best practice in the transport sector. You can also find member-exclusive offers and discounts from our FORS Associates. ‘The Standard’ is sent to FORS primary contacts. If you did not receive your copy, or you’re not a primary contact but would like a copy, please email the FORS Helpline on enquiries@fors-online.org.uk. To download your online version, click here. If you have an interesting story to share, be it about how FORS has helped to improve your business, or an initiative you have introduced to help the community in terms of the environment or road safety for example, let us know by emailing the magazine editor matthew@cvdriver.com.